The First Official State Firearm? Utah Aims At A Pistol The Browning M1911 semiautomatic pistol may soon join the sego lily, Rocky Mountain elk and sugar beet as official state symbols. Supporters say the .45-caliber handgun has defended freedom around the world. Critics call the idea insensitive given recent shootings in Tucson, Ariz., and elsewhere. Utah Gov. 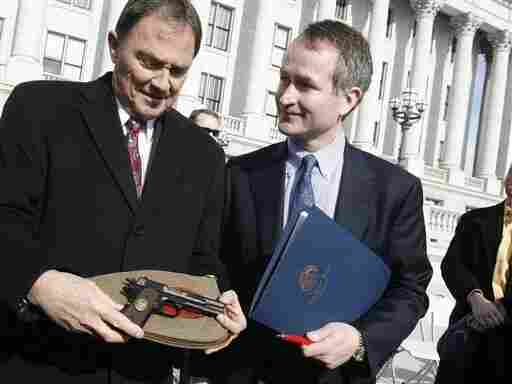 Gary Herbert shows a Browning automatic pistol that was presented to him by Chris Browning [right], the great grandson of John M. Browning, who created the handgun, on John M. Browning Day in Salt Lake City on Monday. This week, the Utah House voted to choose the Browning M1911 semiautomatic pistol as one of the state's symbols. A Browning M1911 semiautomatic pistol may soon join the sego lily, Rocky Mountain elk and sugar beet as official symbols of the state of Utah. The State Senate is considering a measure passed by the House of Representatives on Wednesday that would declare the .45-caliber handgun the official state firearm — the first in the country. "This firearm was created by John Moses Browning, who was a son of Utah pioneers," said Republican Rep. Carl Wimmer of Herriman, Utah, during debate on the House floor. "This firearm really has defended liberty and freedom around the country and around the world. And I think this is a very appropriate designation to capture a portion of the state history." The M1911 is one of several notable Browning firearms and has been used by the military and law enforcement since World War I.
Wimmer characterized the notion of an official state firearm as benign, similar to naming the Dutch oven the official state cooking pot. But Democrat Carol Spackman Moss of Holladay opposed the move. "It seems insensitive to me at this time when many people are mourning the deaths of six people in Tucson and the serious wounding of Gabrielle Giffords, a friend of mine," Moss told the Utah House. "Many people have a negative experience with guns because guns do kill people [when they're] in the hands of those who use them wrongly." Moss also described shootings that took the lives of two cousins: a soldier two weeks away from discharge at Fort Hood, Texas; and a teenager gazing at the stars with a friend when a thrill-seeker shot them both. But guns and the right to own them are big deals in Utah. Hunting and sport shooting are common, and the state has some of the most permissive gun ownership laws in the country. There's never been a case where a handgun has jumped off a floor and started shooting people. There's somebody behind that trigger. And I believe it's safe to say that John Browning has ... done more to preserve the lives of American soldiers on the battlefield than any other person in the history of this country. The rest of the country has noticed. Last year, Utah issued more than 67,000 concealed-weapons permits, with more than 51,000 going to people who don't even live in the state, according to the Utah Bureau of Criminal Identification. Advocates of the right to bear arms are a powerful political force in the state, as Moss noted when she spoke on the Utah House floor Wednesday. "When I was first elected to this office someone gave me this advice: Don't ever speak against guns," Moss recalled, as her colleagues laughed. "And now I'm going to break this advice." Moss said she had a difficult time imagining schoolchildren drawing and coloring the Utah state symbols — the delicate sego lily, the majestic Rocky Mountain elk and the tasty sugar beet — and then turning to a lethal .45-caliber handgun. "Guns have their place, but their place is not among the things we designate," Moss said. Republican Stephen Sandstrom of Orem, Utah, rose to defend the weapon and its official recognition. "There's never been a case where a handgun has jumped off a floor and started shooting people. There's somebody behind that trigger," Sandstrom said. "And I believe it's safe to say that John Browning has ... done more to preserve the lives of American soldiers on the battlefield than any other person in the history of this country." But state symbols are supposed to unify, insisted Brian King, a Salt Lake City Democrat, who added, "I think it's a very poor idea as a matter of public policy that we choose, as a symbol of the state of Utah, something that is as polarizing as a handgun." "There is a huge difference between the actions of a madman using a firearm … [and] patriots using a firearm to defend our country," he said, as he urged his colleagues to vote in favor of the measure. Approval is expected in the state Senate given Utah's gun and political cultures. A vote there has yet to be scheduled. The National Conference of State Legislatures tracks state statutes and a spokeswoman says the group can find no record of an official state firearm anywhere. That means Utah is poised to become the first state in the nation to choose a handgun as an enduring official symbol.